Most market participants have accepted that 2018 is unlikely to be another low-volatility year like 2017, but how do we translate the rising volatility into our market forecast? Some Wall Street bulls such as RBC’s Lori Calvasina have revised their year-end forecasts down recently. * Are those revisions because of the higher VIX? Does a rising VIX signal lower equity returns? This may be a misconception among many investors. A rising VIX is usually accompanied by sequential negative market returns, the magnitude of which can be substantial, particularly during a rapidly increasing VIX environment. Therefore, we tend to associate lower returns with higher VIX. However, by definition, higher VIX is only a reflection of volatile movements in the market – it is not a predictor of future returns. Nevertheless, the VIX is still powerful in terms of explaining market returns. If we assume that the relationship between the VIX and the S&P 500 is linear for the sake of simplicity, then we can capture a -1:0.1145 movement ratio between the VIX and the large-cap index. In another words, a roughly 9% increase in the VIX translates into a 1% drop in the S&P 500. But this oversimplification is not realistic, since we can see from Figure 2 that the distribution of the VIX is rather skewed compared to the S&P 500. Statistics 101 tells us that the relationship is not linear. 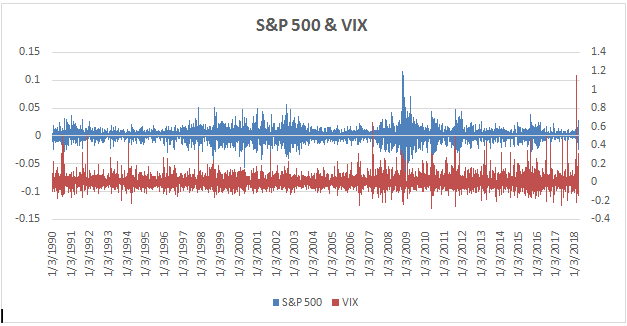 Instead, if we look at the sunflower plot in Figure 3 (yes, sunflower plot is a scientific term), the relationship is also unlikely a complex curve; rather, the VIX is more subject to drastic movements than the S&P 500 is. Is AMZN Stock A Multibagger Stock Even Today?